New York-style Brunch with pancakes, waffles, maple syrup and other sweets has become an American Tradition. What about all the foreign-born and/or raised New Yorkers who want a different flare? A less sweet or spicy, or other original, ethnic, international cuisines. And what happens if you and your friend/spouse want to eat together, but he/she wants the traditional New York brunch menu and you crave a non-New Yorker, different, ethnic cuisine? Talia’s has it all: from the pancake & waffles fair to the hummus, falafel, kebab, shakshouka, burger, Thai beef salad, Israeli salad, Greek eggplant salad, etc. You no longer have to compromise! Talia’s has everything you, your Israeli grandpa and your 5-year-old American born-and-raised pancake lover, could ever want! Talia’s has created an NEW unique combination of American, Middle-Eastern and Israeli brunch favorites, both sweet and savory, excellent for any palate! Your child will have pancakes, you will enjoy chicken kebab with hummus and your grandpa will LOVE our homemade Shakshouka! Now imagine all the above mentioned yummy dishes, while you are sitting in a large outdoor cafe; the pleasant brunch-time sun is shining over you; your dog is on the other side of the partition; and you … you are enjoying a Bloody Mary, Mimosa or a Screwdriver (we have chilled Champagne for you ladies!). Talia’s Steakhouse & Bar specializes in breaking through the forefronts of Glatt kosher cuisine. 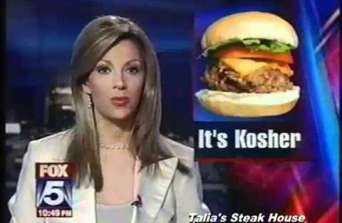 We made TV, radio and the papers with our Glatt Kosher Cheeseburger with non-dairy, American or Mozzarella, tofu cheese. See it here. Serving Manhattan-style brunch in a Glatt Kosher meat restaurant is a very challenging task, when it comes to building a Manhattan-style typical brunch plate, using a variety of non-dairy breads that are “kemach yashan” and the same time are suitable to the taste of the particular favorite entree. Yes, pita goes with hummus, but what about toast with butter? Talia’s innovative Glatt kosher brunch menu is an ambitious mission to provide any guests with the dining experience of a non-kosher Manhattan brunch restaurant, yet in a Glatt kosher establishment. By doing so, we strive to broaden the gastronomic horizons of our guests, who are curious about the typical Manhattan-style, non-kosher brunch cuisine. For those who have had no exposure to Middle-Eastern cuisine, it’s a chance to spice things up with all our homemade specialties: hummus, tahini, babaganoush, falafel, beef and chicken kebabs and many more.